With Father's Day approaching, my mother has just told me I've been a great dad to my 4-year-old son and a great husband to my wife. She said I was a great family man like her father -- my Grandpa Balsamo. This was a huge compliment. I felt touched. I felt honored. I felt like my mom was going to say, "Hah, just kidding!" I've known since I was a young boy that my Grandpa Balsamo loved to play the saxophone and the clarinet, but I thought he did it strictly for fun. I learned that at one time he made money as a musician and had hopes of playing music for a living. Unfortunately, because it was such a tough profession during difficult economic times, my grandfather was more likely to go pro as a rock/paper/scissors player than to make a living as a musician. So, soon after getting married and starting a family, my grandfather began a career as a machinist. Since my grandpa's death, I've often wondered if he was disappointed that his music career never took off. I wonder if he regretted taking work as a machinist. I'd like to know his true feelings on that. I asked my mom what she thought, and she said my grandpa was always happy. She said she'd send me a video interview that my aunt had conducted with him. My mom said I might find what I was looking for in the video. While I waited for the package to arrive in the mail, I dug up a picture of my grandpa when he was about my age. He was sitting at a work station in his garage repairing an instrument, a job he did during the day to make extra money while he played music at night. Like always, my grandpa was grinning in the photograph. But I wondered, was his smile true or just for the camera? Was he worried that repairing instruments was earning him more money than playing instruments? My grandpa’s skill with his hands would soon allow him a career outside the music business, an opportunity that would provide the money he needed to support his family. Did he know such a fate was ahead? 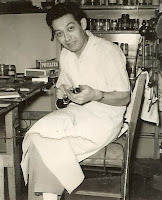 Sitting there repairing that instrument in the photograph, one leg relaxed over the other, was my grandfather settling into a life unfulfilled, the reality of playing music professionally slowly slipping away? I have dreams, just like my grandpa had, and I've had to put those dreams on hold at times to make a living to support my family. I know the feeling of defeat, and I know the feeling of fear that my dreams are slipping away. But I always try to convince myself that it's only a temporary defeat and not permanent. I tell myself that even Superman couldn't support himself rescuing people -- he had to become Clark Kent and work a day job at the Daily Planet in order to make ends meet. I try to believe that one day my dreams will become a reality if I just keep trying. My mom's video showed up in the mail after a couple of days. I watched my grandpa's interview with great enthusiasm, examining every frame carefully, looking for clues to this man's passions in life, his successes and his failures, and for telltale signs as to whether he made the choice to abandon his dreams or if he had no choice in the matter. I learned that my grandpa's dad, my great-grandfather, died before my grandpa was in his teens. My Great-grandmother Balsamo had to raise eight children alone. In the interview, my grandpa said that, despite what happened with his dad, his was a very happy family, and that he was a happy kid. He did lots of fun things like working a paper route, attending school and shining shoes at a barbershop. Fun? Each family member, young and old, my grandpa said, had to pitch in around the house and work so that the fatherless family could survive. But everyone was happy because they had each other, he said. Later in life, my grandfather and my grandmother would raise five girls. It was a happy family, according to all. My mom tells me that my grandpa always put his family first -- before work, before music, before everything. My mom has countless stories to prove this, which is why when she told me that I was a great dad like hers, I was so deeply moved. But when my mom told me this, I couldn't help but wonder if I was heading down the same path that my grandpa traveled, for better or for worse. I wondered if my dreams would ever come true. Before my grandpa died almost five years ago, I visited him in the hospital. He asked about my personal dreams and if I was still pursuing them. Yes, I said, I was still working my way toward my goals. He smiled, as if he knew the challenges and almost as if he knew my fate. And then he asked me about my family -- my wife and newborn son. I said we were all very happy. He smiled again. That was the last I saw of my grandpa alive. About six months ago, I learned about a really bright girl who graduated from high school with outstanding grades and honors. She was offered $185,000 in scholarships for college -- an unbelievable opportunity. She turned it down. I found out she grew up in a fatherless home with no siblings. For many years, she lived on the street. Instead of accepting the scholarships and an education, this girl got married to someone who really couldn't support her, and the two of them started a family. It seems that building a family was more important than anything else to this girl. Still, so many people around her, including myself, couldn't believe she turned down so much money and an education, which would have made her life so much better. But I wonder. If my grandpa were in the girl's place today, which way would he go? If I were in the girl's place today, which way would I go? Which way would you go?